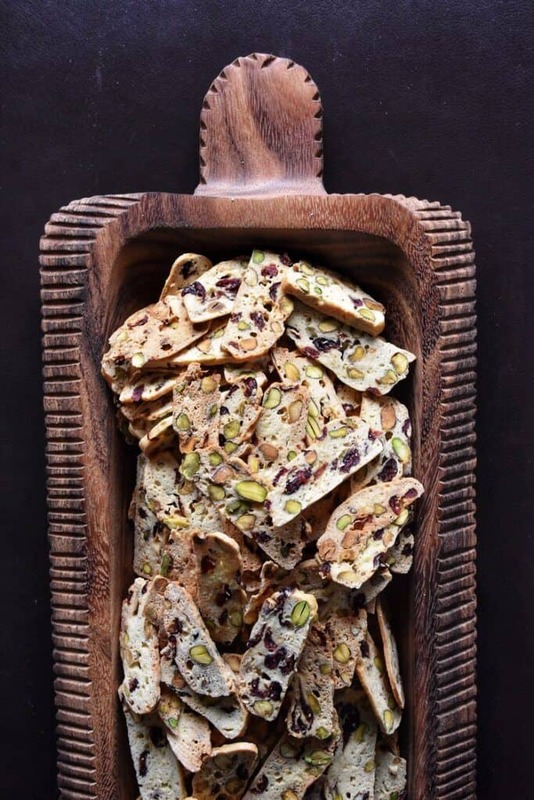 Your holiday cookie platter will be complete with these Thin Cranberry Pistachio Biscotti. Festive looking, great tasting & so easy to make! Nothing says the holidays like cranberries and pistachios. Since holiday baking is just around the corner, I thought I would share one of my go-to holiday biscotti recipes with all of you. Biscotti are wonderful, aren’t they? I’m not just saying that because I love biscotti, because, well, I do love biscotti. These are also some of the reasons why I always start my holiday baking by making biscotti. Spoiler alert: These cranberry cookies will quickly become one of your favorite Italian Christmas Cookies that you will make not only for the holidays but throughout the year. I will not deny that these particular biscotti are a little labor intensive. There are well over 200 super thin biscotti that need to be sliced and baked. But you will be rewarded with a great tasting biscotti. We begin by making the dough. 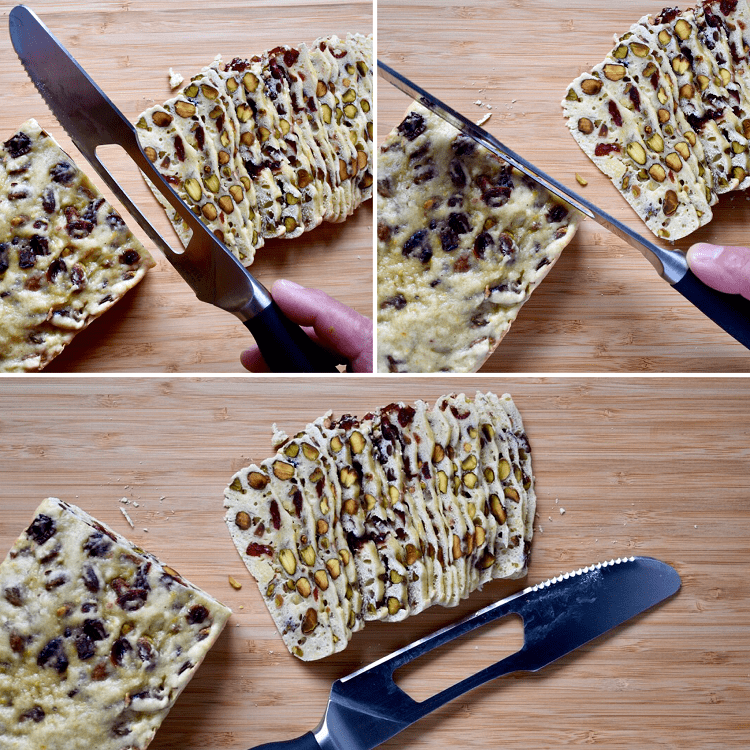 This easy biscotti recipe includes orange zest, plumped cranberries and pistachios. You will quickly notice that this mixture cannot be “rolled” into the traditional log shape. Instead, what we are going to do, is transfer large “spoonfuls” of the dough on the parchment lined cookie sheet, trying to create a shape that resembles a log. Then, with slightly dampened fingers, press and shape the dough into a log and bake. You will notice there is no baking powder in this recipe. As a result, we can get away with placing three logs on a very large baking sheet since expansion is limited. If you prefer, you can also use parchment lined loaf pans. In the oven they go for about 15-20 minutes, until they are firm to the touch. Once baked, you will inevitably notice that these loaves are extremely pale looking. Not to worry. Remember, they are going in for a second bake, but first they must be sliced. A very sharp knife is crucial in order to get very thin slices. I was anxious to try out my new Chicago Cutlery Sandwich Hero Knife (not sponsored). This knife was part of the swag bag that I received at a recent Food Bloggers of Canada Conference in Ottawa. I have to admit, the knife was perfect to slice the biscotti with. Not sure if you can tell, but the front part of the knife is serrated, and the middle part is just a sharp blade (intended to cut cheese, from what I understand). Well, I used the front part to anchor into the biscotti and then, like a guillotine, I just pressed into the loaf to slice the biscotti. Perfect, wafer thin slices. Worked like a charm! Thanks Chicago Cutlery! 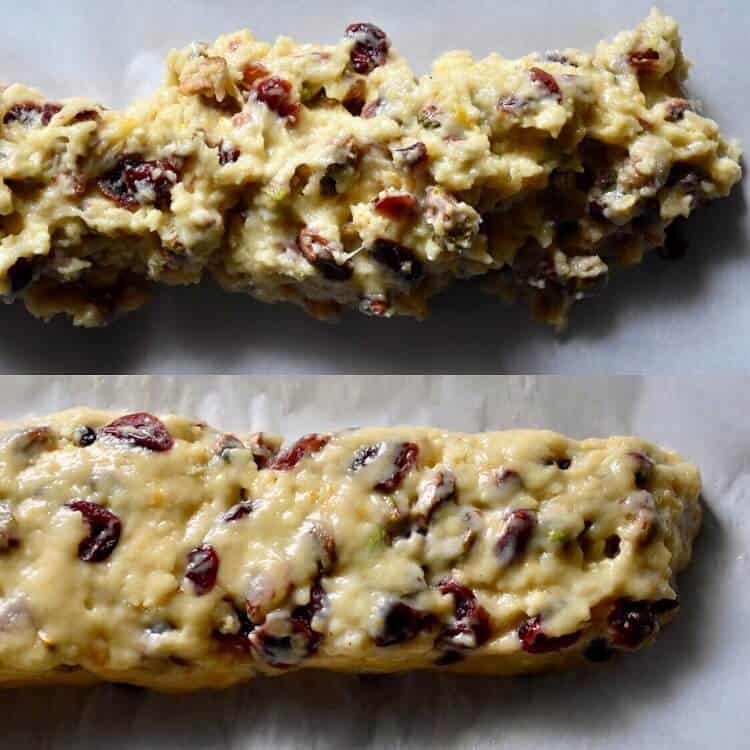 Your Super Thin Cranberry Pistachio Italian Biscotti are ready for the second baking. And just like that, you are done! The inspiration for this recipe came from one of my mom’s dearest friend, Nunzia. If you recall, I have already shared her recipe for Thin Crispy Almond Biscotti. That was almost three years ago! My, oh my, where does the time fly! Since the holidays are right around the corner, I thought it would be festive to replace the almonds with cranberries and pistachios. I also added some orange zest and I decreased the total amount of flour. These thin biscotti chips will still provide you with that crispy texture you all know and love. 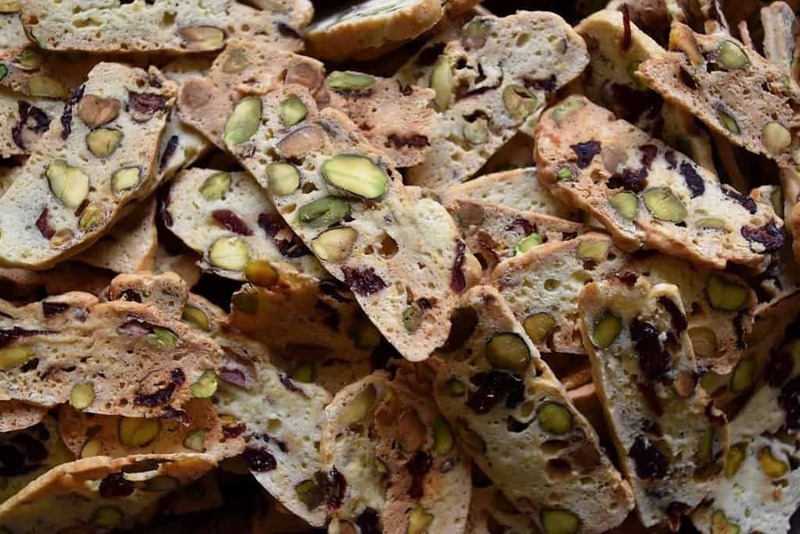 But when you bite into these biscotti, you will be pleasantly surprised by the perfect amount of chewiness provided by the cranberries. As they say, betcha can’t have just one. 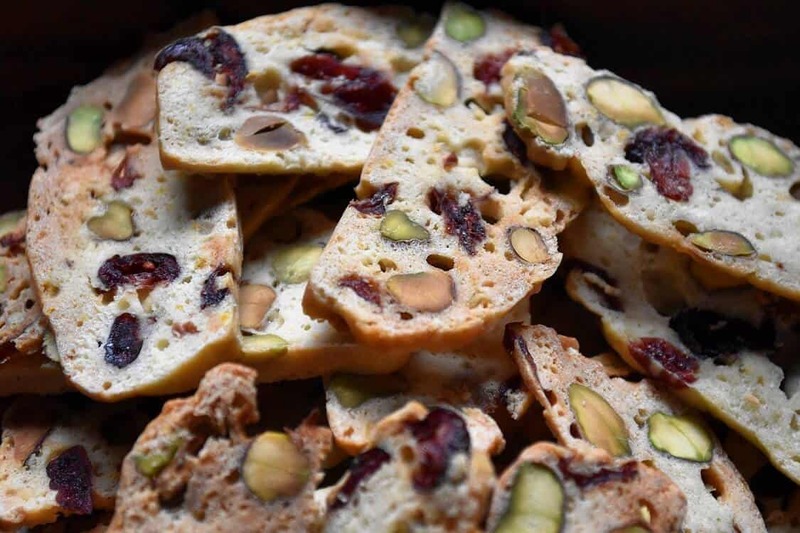 ★★★★★ If you have made this Thin Cranberry Pistachio Biscotti recipe, I would love to hear about it in the comments below and be sure to rate the recipe! 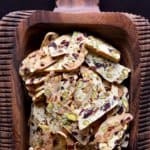 Your holiday cookie platter will be complete with these Super Thin Cranberry Pistachio Italian Biscotti. Festive looking, great tasting & so easy to make! Soak the cranberries for about 10 minutes. Drain and pat dry with paper towels. Set aside. Line baking sheet or loaf pans with parchment paper. In a medium bowl, sift flour. Add the pinch of salt and the orange zest. Combine together and then set aside. In a large mixing bowl, or bowl of electric mixer fitted with whisk attachment beat the yolks. Gradually add the sugar. Whisk together. Make sure to scrape down the sides of the bowl. Switch to paddle attachment. Add flour to egg mixture and incorporate. 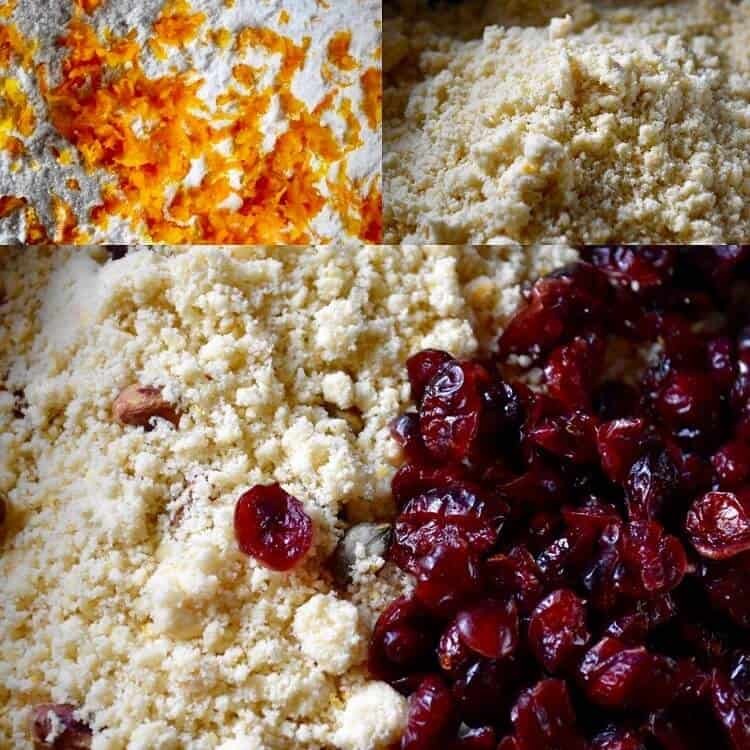 Mixture will look like bread crumbs. Once again, make sure to scrape down the sides of the bowl. 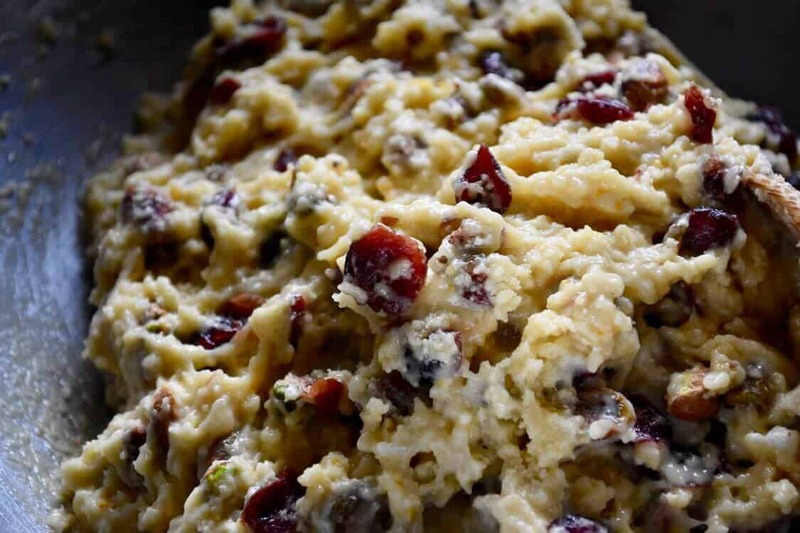 With wooden spoon, incorporate the pistachios and cranberries. Set aside. In a large mixing bowl, or bowl of electric mixer fitted with whisk attachment beat the egg whites until they reach the stiff peak stage. Fold the egg whites in the flour and nut mixture. Bake for approximately 15 - 20 minutes or until firm to the touch (will take a little longer in the loaf pans). Remove from oven, wrap in clean dish towels and allow to cool down. Once cool, transfer loaves to cutting board. Using a very sharp or serrated knife, slice cookies about 1/8 inch thick (or thinner). Place slices flat on the baking sheets, and bake for about another 10-15 minutes (the longer they stay in the oven, the crispier they get). Flip the biscotti over halfway through the bake time. Can be stored in an air tight container at room temperature for a few weeks. 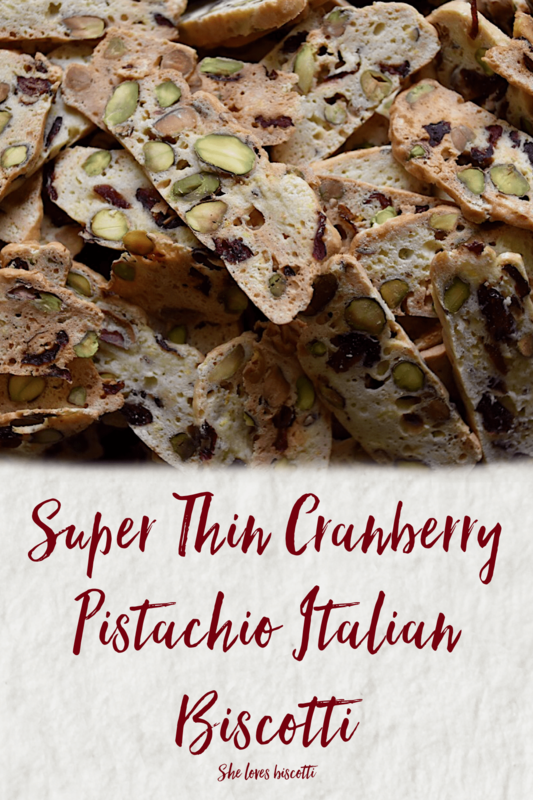 IF YOU ENJOYED THIS Thin Cranberry Pistachio Italian Biscotti, SAVE IT FOR LATER. PIN IT TO YOUR BISCOTTI BOARD! I tried these with pepitas replacing the pistachios due to my sons nut allergy. I was hoping to replicate the green and red festive colours. The pepitas mostly turned grey/brown during baking so sadly they don’t look as good. They still taste amazing! Thanks for the recipe. Looking forward to hearing from you again. Thanks so much for taking the time to comment, truly appreciate it! Hi Maria! Can I divide the proportions by 3 if I wanted 1/3 the amount of servings? Hi Serena! Although I have never tried, if I may suggest…I think you might get better results if you cut the mixture in half. It just makes for better manipulation of the dough. These biscotti keep really well… even without freezing… although they never seem to last in my house 😉 If you do decide to make them, I would love to hear about your experience with the recipe. Hi Maria! I halfed them as you suggested… rounded up the eggs … had to add a bit more flour as the end batter was really runny.. ..they cut up wonderfully and crisped fine! Made cashew and raisin ones cos that’s what i had at home. Thank you! Fantastic Serena! Glad you were able to “fix” the batter 🙂 Cashews and raisins sounds like a great combination. Thanks for sharing your experience with halving the recipe 🙂 Have a great day! Hello Maria. Thank you for the wonderful recipe. I wanted to know what can be a substitute for orange zest. Coconut shreds, maybe? Made them just in time for Christmas. Wonderful recipe and so tasty. Thank you, Maria. Hi there, is the flour you use, ground almond? It looks like it in the photos at the top. These are beautiful little cookies. Oh my! I have no words! These look just perfect, the only problem for me would be that there would be none left for the cookie trays. Cranberry and pistachio are a colorful and complementary combination. I see you are getting an early start on the holiday baking, good for you. Hi Biscotti Girl, Great recipe – looking forward to making them for them Thanksgiving. Year ago I ran across a recipe for funeral biscotti – very very thin and served with wine. Would love find it again. They turn out very very thin and where extremely delicious with a glass of wine Great for dipping in wine. Hope you can help. How pretty. Perfect for the holidays.